This chart covers the week commencing March 25th to March 31st. There's not a lot of movement in the chart this week. Fortnite is staying firmly in the top spot for another week, and it shows no signs of dipping. The battle royale upped its views by 17.6 per cent last week, racking up over 32.1 million hours watched. League of Legends stays in second place and ups views by a nice round 5 per cent. Grand Theft Auto: V remains in third after a 4.3 per cent increase in views last week. Sekiro: Shadows Die Twice is still in fourth place despite a 15 per cent decrease in hours watched. Apex Legends is hot on Sekiro's heels in fifth but still lost 23.1 per cent of views compared to the week before last. Dota 2 is in sixth for another week despite a sizeable 36.6 per cent drop in hours watched. 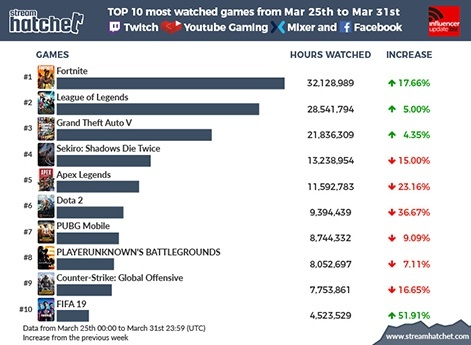 PUBG Mobile remains in seventh after a 9 per cent drop views, and regular PUBG moves up to eighth despite a 7.1 per cent decrease in views last week. CS:GO is in ninth place after being knocked down a spot by PUBG, and its views decreased by 16.6 per cent in the last week. 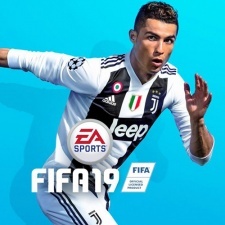 FIFA 19 makes a reappearance in tenth after a 51 per cent increase in hours watched. Last week saw the first ePremier League tournament take place which saw a slew of FIFA players return to the title.